Amour [Love] had its Australian premiere at the Sydney Film Festival after screening at Cannes last month, for which the master Austrian director, Michael Hanke (Funny Games, The White Ribbon), won his second consecutive Palme d'Or. Amour follows Georges (Jean-Louis Trintignant, The Conformist, Trois Couleurs: Rouge) and Anne (Emmanuelle Riva, Trois Couleurs: Bleu), retired music teachers in their 80's with a daughter, Eva (Isabelle Huppert, The Piano Teacher), who lives abroad with her family. The couple's eternal love is severely tested when Anne suffers a debilitating stroke at the breakfast table one morning after attending a piano recital of one of Anne's former students in Paris. The stroke, which paralyses the right side of her body, leaves her house-bound and completely reliant on the care and continued devotion of her husband. As Anne begins to slowly deteriorate, the result of a second stroke, both her immense suffering and the tremendous stress and heartbreak this causes Georges is more-than-effectively conveyed to an audience that can only watch in both awe at the craftsmanship on display and despair at what we are literally being forced to watch. Haneke masterfully crafts an honest, exhausting and emotionally devastating portrait of the strength of human devotion, delving into the fears that everybody has about old age, whether it is suffering like Anne does, or watching a loved one suffer and being unable to help them. Georges has to make some extremely challenging decisions throughout the film. Due to Anne's fear of hospitals, he doesn't want to admit her, but adheres to her wishes to be taken care of in the comfort of her own home. As a result, he has to enlist expensive nurses and learn how to take care of her himself. Though he does the best he can, his frustration is apparent, often to heartbreaking affect, and he makes some dubious decisions when his daughter, who feels professionals should care for Anne, visits. Trying to imagine what I would do in a situation like this makes me very scared, and I backed Georges every step of the way. 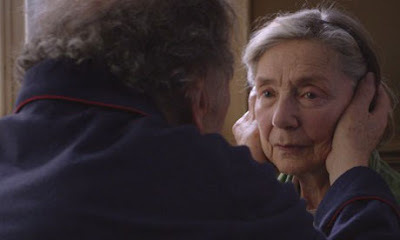 Amour achieves a level of perfection in almost every frame, with Haneke using a stationary camera and letting the scenes unfold at great length. Even when he cuts in between two characters talking, he remains focused on each character for long enough to ensure their emotions are conveyed. Georges and Anne's home is truly a marvel, while the compositions - the result of perfect lighting - and framing decisions are extraordinary. Typical of Haneke's films there is a complete absence of a score, meaning we are not influenced by anything but the images appearing before us. There is nothing more to say about the two lead performances other than that they are amazing. I am surprised Emmanuel Riva didn't win Best Actress at Cannes. I doubt I will see a more convincing portrayal from anyone this year. This is an extremely tough role, both physically and mentally, and Riva delivers flawlessly. Trintignant, a legend of French cinema, though he did star in Bernardo Bertolucci's The Conformist, is also wonderful. Isabelle Huppert, always a class act, gives strong support. I guess the only initial issue I had with the film when I left the cinema was its length and that the film's plot didn't really sustain the two hours. But I have come to the realisation - and taking into account that it was my fourth film of the day and I was already fatigued entering the cinema - that the exhausting nature of the film is precisely Haneke's intention. Georges' days, devoted entirely to tending to Anne, would have felt like they would never end and he would never have a reprieve. The audience is given none either. It is masterful. A gruelling but beautiful portrait of what love truly means featuring some remarkable sequences that evoke shock, fear, despair, sincerity, immense sadness and even some joy and a pair of extraordinary performances. Haneke is inarguably one of the best directors working today and he has delivered another masterpiece here. Sounds tough. Not sure if this is a film I will enjoy but will give it a go on rental. Great review! Its tough going but it is Haneke at his best as a craftsman, and it is devastating and beautiful at the same time. Lovely review Andy, the movie sounds amazing and the Palme D'Or will surely raise awareness on it. The topic is challenging and I think I will personally love it, as I am sucker for character development and tragic situations. I can't wait to see it, I wonder when it will be released in the UK! I'm not sure when it has a UK release, but Haneke has now won two straight Palme d'Ors. That is amazing, and his film is something special. It is very challenging, but when you think about growing old all of the fears are realised here. It is very relevant. The acting is sensational and EVERY shot is carefully thought out and executed. Check it out. Great review! I can't wait for this one - sounds like devastating and beautiful movie. Thank you. I didn't say as much as I would have liked, because I just wanted to get some thoughts online. Also it was my fourth film of the day, which made the second half gruelling. It is both devastating and beautiful. Spot on. I hadn't heard of this film, and it sounds amazing. Thanks for the beautiful review. My pleasure. Its a tough film experience. Haneke forces you to watch this elderly couple deal with a stroke. A lot of what happens is not particularly pleasant, but it is gripping. Saw it last week at MIFF. A fine review of a very absorbing, wonderfully directed film. Thought Trintignant was just brilliant as Georges! It is an extremely powerful film and both of the performances are phenomenal. Haneke's direction is also remarkably assured - forcing us to watch Ann deteriorate and Georges grow increasingly devastated. The stationary camera and absence of a score means that the raw footage isn't influenced by anything else.